I didn't say that the test is easier now. I said that it is easier to pass because they do not break it up into sections. They allow you to miss 45, regardless of if you miss all 45 in the coding portions or 45 in the Med terms and Guidelines. If you read my post, thoroughly, you will see that I explained that. I also explained that the test is hard, PERIOD. Twist my words into something negative, if you wish, but that is definitely not what I was saying. Last edited by ohn0disaster; 03-25-2011 at 10:38 AM. I am taking my CPC-H exam in May and am very nervous about it. I too had been wondering the % needed and I had ordered the study guide and the practice online tests so I am hoping I pass the first time. Good luck to everyone else!! The best advice I can give is to be familiar with the reference books and to sharpen your comprehension skills. The most important thing is time management, and if a person is a slow reader or has to re-read scenarios repeatedly, they are going to run into problems on the test due to the time contraints. Good luck to everyone!! I just took the CPC exam for the second time this past Saturday. Waiting on the results now! The first time I failed due to time. When the proctor gave the "1 hour left" announcement I was literally on question number 70. I had to guess 80 questions in one hour. I spent too much time on the first 70 questions (huge NO-NO). This time my strategy of going through the entire test and answering the simple and short questions and leaving the harder questions for last seemed to worked quite well for me. I got done in perfect timing and I used the process of elimination basically on every question. I hope to become certified this go-around. Please keep me in your prayers! I readily passed the CPC exam the first time without any coding experience. How is this possible? It is not because I am a natural-born coder, that is for sure! I became quite familiar with my coding manuals, they were totally dog-eared, and I had thoroughly marked up critical information using the info I gleaned from the Blitz Review Videos. This helped me see what I was looking for much more quickly. I also took the AAPC practice exams and forced myself to learn to go fast enough. 50 exam questions should take about 1 hour 50 minutes. The critical thing about taking any practice exam is to thoroughly review all the answers. You can go slowly through this part. Repeat the practice exams until you are getting about 85% right, then you should be able to pass the real exam. I also used this practice exam and did the whole thing at once during a 5 hr 40 min session when I was home alone and did not answer the phone! 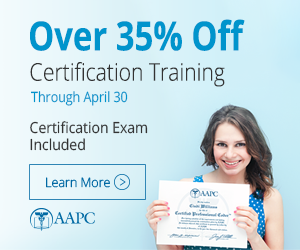 It gave me some understanding I needed beyond AAPC practice exams. But again, you need to take the time to thoroughly review the answers! I am glad I took the time to thoroughly prepare, even though all these items cost me some money. The CPC exam was definitely a tough exam and a challenge to sit through! Prepare, and you will be glad you did! Wishing you success! I took the exam this past Saturday and got the good news today. My advice is to answer all the med term, HCPCS and any area that you're very strong in first that will build your confidence up. Modifiers and ICD-9 codes are very helpful in making a decision between code choices. And most importantly....relax you can do it.